I was talking to one of the guys, trying to get him to tell me what he was in for, when the alarm sounded. Even my chaperone looked nervous as he gave us the signal to get out. As we picked our way through the prisoners, all of them now lying down on the ground, there were heckles and shouts of abuse directed at us. What had seemed a relatively benign environment now felt scary and dangerous, and I was relieved when we all made it safely back outside the yard. 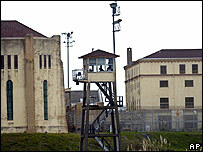 A few days later I left for good, still not quite believing the strangeness of San Quentin's world-within-a-world and very grateful that I at least had the option of going home. 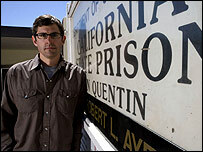 Louis Theroux: Behind Bars is on Sunday 13 January at 2100 GMT on BBC Two. Does anyone outside the UK like Louis? He does really good documentaries. There are lots of older ones on youtube Soth, check them out if you can. I don't know when this one is on in other countries, but it can't be too much longer after it airs here tonight. I love Louis too. Also love his dad Paul's travel books. I'll watch out for this docco. That's where I've seen him. I doubt this will run here which is too bad. Another item for the download list! Thanks Honey. He seems to wear his geekines as a bulletproof jacket. This is an awesome observation. You nailed this. This is exactly his confidence and appeal. louis theroux is hot (i guess i have a thing for geeky boys) and i love his work. i hope i can find it on the internet. I think he's adorable. And very cute, i'll fight Sputnik for him. I've seen a few of his lost weekends. I thought the one he did in a brothel in Nevada was incredible and I also liked the one on Neonazis. I think most of his shows are available for download. I thought the one he did in a brothel in Nevada was incredible. I don't know if people outside of UK can watch this but I will post it hoping they can. You can watch the docu here. damn, it's only available in the UK. bastards. Oh I love Louis! This sounds fantastic! I can't wait to check this one out. So glad he's still doing the docos, he's so damn good at it. Plus then he can see you in all your glory in sharp focus. Kids doing life behind bars? Thoughts?